I've learned that in this house having freshly baked muffins are one way to keep everyone happy at breakfast. That way I can get ready and everybody is fed something that they'll actually eat. Yesterday Sadie voted that she was tired of banana muffins (which was good because we're out of bananas and banana muffins) and I looked around the kitchen and decided to come up with something new. I have a lemon poppy seed muffin recipe that I love... but I was in the mood for something different. I wandered around the kitchen. We're running low on food at the moment so I decided to get creative. After ransacking the pantry area downstairs and the freezer (for cranberries) I had an idea and I began combining ingredients. The batter was still too thick. I glanced around and saw the pot of chamomile tea I'd made and threw in a third of a cup. Perfect! About half an hour later I was putting the first batch of muffins in the oven and hoping against hope that they would be as good as they looked. A while later Sadie and Maggie were both carefully eating muffins that had just cooled enough to hold in their little hands (they'd been waiting not very patiently). 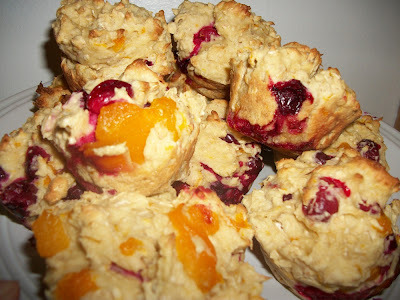 And the muffins were a huge hit. I will say that I think that they're thick enough that you could probably make them as scones instead of muffins, but I had a muffin tin out and so muffins they are. Here's the recipe. Mine are wheat free but if you want them to be gluten free you'll have to make sure to find gluten free oats! I combined all the dry ingredients first and mixed them well and then added the wet ingredients (including the cranberries) and combined them with a mixer and blended the whole thing until the batter was smooth. Then I scooped the batter into muffin tins (that had been greased with coconut oil) and baked it for 21 minutes at 350 degrees and then set them aside to cool. I have a feeling these aren't going to last very long around here!